A RARE GIANT squid measuring almost 6 metres long has been found off the coast of Dingle, Co Kerry. It is the first time in 22 years that this type of squid has been found in Irish waters. The 5.8 metre (19 feet) squid was caught on 15 May by fisherman Pete Flannery of the fishing vessel Cú na Mara during a trawl on the Porcupine Bank, off the coast of Dingle. The squid is currently in Dingle’s Oceanworld Aquarium and it will soon be brought to the Natural History Museum in Dublin. Director of the aquarium, Kevin Flannery, said the finding is incredibly rare. “They’re so elusive, you’re going back to 1673 for the first one found [in Irish waters] and there have only been five of these found in the last 350 years,” Flannery told TheJournal.ie. Years ago, sailors were unable to identify the squid because they had no knowledge of its kind. However, Flannery said that the squid can now be recognised by its beak. “They were identified first when whalers were catching whales and killing them. hey would open their stomachs and find the squid beak. “The beak looks the same as a parrot and they found these strange beaks and strange bones that are like plastic. Evolution has made it that they don’t need bones. Sailors years ago couldn’t find out what they were but now they know,” Flannery said. The squid can be harmful to human and to prey, with large tentacles that have suction cups and nails attached to them. Some can grow up to 16 metres. “They’re regarded as dangerous. It has these large tentacles that have suction cups that could come out and grab you,” Flannery said. The giant squid contains ink that it can use as a defence against predictors, releasing a dark cloud. 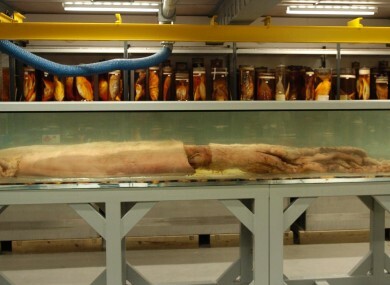 Email “Rare giant squid caught off the coast of Dingle to be brought to Natural History Museum”. Feedback on “Rare giant squid caught off the coast of Dingle to be brought to Natural History Museum”.